I know what happens when children are separated from their families.They collapse into themselves and try to become as small as an atom, infinitely divided. They fold their sorrow over and over again—hoping that by taking up less space, they may create room for their familias to rejoin them. There is no understanding, no reconciling or consoling the feeling of abandonment. We grow up with a gaping wound in the center of our chests and shrink into ourselves to hide our permanent dissonance. When children are taken from their families, they forget their parent’s names: ma y pa’s love required no introduction. When their teachers ask them who they can call at home, they cry, fearing that no one will be there waiting for them. Being a child and separated from your family leaves you suspended in the space-time continuum: there is no up or down, no space or ground, no logic capable of explaining your utter displacement from within and without. We try to take a hold of our grief and compress it down, force the palpable emotion of our devastation together till its density is twice of the sun. We become neutron stars, one stage removed from black holes, ready to burst and explode—all at once. We store our trauma’s away in the universe of our hearts, run our fingers over the scars of separation from the ripping apart of our parts. 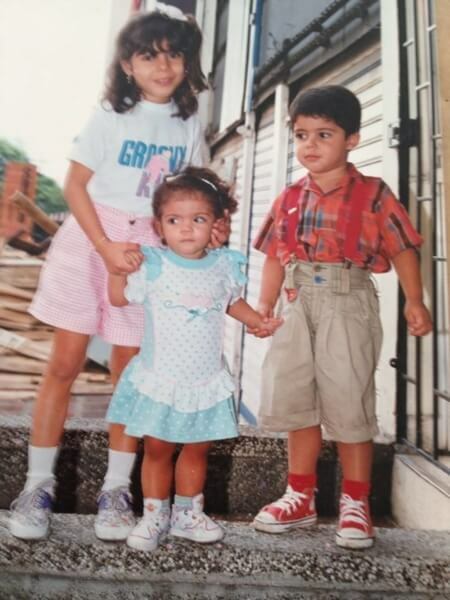 Marcela Rodgriguez-Campo center poses with older siblings. I was born in 1992, the year before Pablo Escobar’s assassination in my home country of Colombia. Leading up to and after his death, the country was awash in violence. My parents remember the car bombs, friends and family being threatened or going missing, the corruption of the government by drug traffickers. My father emigrated to the U.S. first, his departure largely a blur in my memory. Then one morning, my brother and I woke up to find new socks next to our pillows. Without warning, my mother and older sister had gone, too. All that was left was the two of us, placed in the care of our grandmother. I was three years old. When my mother left I was a healthy toddler, but when I finally saw her again at age five I was severely underweight, borderline malnourished, and mute. I did not talk during my first year in the United States. I was the shell of a child, my inner three-year-old trapped in the corners of my mind, peering out into this unknown new world. Physically and emotionally, I was stunted by the entire experience. I began talking eventually, but I found my voice through creating. I doodled, painted, and wrote with all the colors that had been dulled by the displacement. It was only when I entered college that the words came back, that I began to reopen the wound and make sense of what happened to me, to us. The words I did not have as a child finally arrived: abandonment, separation, trauma, loss, pain, silence, sacrificio. Even as adults, my brother and I still struggle to keep on weight. We are quite gangly, our wrists too thin to be adult bones and our sternums always protruding through our clothes. We were the ones that were left behind. Even to this day, I still shut down at the sight of stress or hardship. Almost instantly I fall back into myself; I become a shell of a shell of a woman with three-year-old eyes peeking out at the world; I go into hiding. And I am lucky that those who love me are willing to reach into my insides and lift me out of there; they coax me out with their hugs and cooking till I can stand within myself again. It wasn’t until 6th grade when I picked up my first memoir that I found pieces of my story written on the page. My teacher wanted us to read autobiographies for our independent reading. She let us pick anything that we wanted. Some students read about Michael Jordan, others Jackie Robinson, or race car drivers and scientists. I read a Holocaust survivor’s story. At the time I didn’t know what a holocaust was. The dictionary defines a holocaust as: 1) a great or complete devastation or destruction, especially by fire, 2) a sacrifice completely consumed by fire; burnt offering. 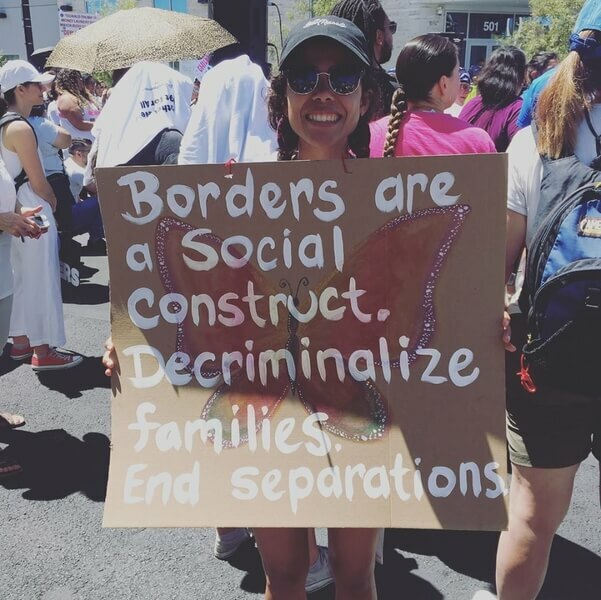 Marcela Rodgriguez-Campo protesting current U.S. immigration policies. For our presentation we had to pretend to be them, and then be interviewed by her in front of the class to demonstrate our comprehension. On presentation day she called my name only to be utterly shocked as I hobbled to the front of the room. She quickly realized that I was no longer the student she knew, I was a weathered woman with a con-caved spine, a scarf wrapped around her head, and shaking wrists that seemed both frail and yet purposeful. I couldn’t tell you the name of the memoir I read, but I could tell you her story. She had been separated from her family early on during the Holocaust. She was about twelve years old when it had started. By chance, the German S.S. Officer assigned to her ghetto had determined that she didn’t meet the criteria to be considered a Jew. He growled at her to leave, and with her sister’s pleading eyes urging her to go, she left. She slowly backed away and once she was out of range ran for her life. Through ghettos, concentration camps, and death marches, she spent the rest of her life searching for her family: her mother, her sister, and her father. At the end of my interview, my teacher and classmates just stared at me, they had looks of surprise and despair. I felt like a museum artifact. My well-intended teacher commended me on my performance, “you did so well” she stammered, “you became her!” I had not become her, I was her: a brown version of a Holocaust survivor, the burnt offering of our country’s immigration policies.